This is now the second time I have crossed the North American Continent. On the first occasion I did it in a little over five days; this time I have spent seven months on the journey. I shall never forget the impression of immensity that first journey made upon me. At Boston I boarded the train in the evening, and in due course climbed into my berth. Next morning I climbed down, and had breakfast. In the afternoon I had lunch. 3Later I had supper, and went to roost in the roof. Down next morning; through the same programme, and sought my perch at night. Day after day, night after night, this went on, the train all the while speeding on its seemingly interminable journey, Practically in a straight line. My favourite off-study is astronomy, which has led me to think somewhat disrespectfully of this "speck-of-dust" planet of ours. The best antidote for that contempt is a non-stop railway run from ocean to ocean, through less than one-eighth of the length of the equator. I for one have come to realise that "our little world" is of quite decent dimensions, and has no reason to be ashamed of itself. My first visit to Vancouver, seven years ago, was by accident. The journey Eastward took out of me some of my British conceit. From Boston to Moose-Jaw the several trains I travelled by were all up to time; but no sooner did I get under my beloved Union Jack than things went to pieces. When we reached Mission Junction I found that I had lost my connection for Seattle — no self-respecting train could be expected to wait for five hours — and had to go on to Vancouver, where in fifty minutes I started afresh for my final destination. Vancouver has ever since been associated in my mind with one of the noblest actions of my life. I spent most of my short time in a stationer's shop, writing picture postcards home; so that my friends saw a good deal more of Vancouver than I did. It has been suggested that the explanation lies rather in the direction of stupidity, or a desire on my part to impress my friends with the idea that I had seen much; but all such insinuations treat with the room they deserve. In those days a few hours' lateness was nothing thought of. This time I arrived from Calgary on the minute, in a train which had done the entire tarns-Continental journey. Vancouver I judged to be, for situation, the most beautiful Canadian city I had visited; though I afterwards felt that it must give the palm to Victoria. Vancouver is not old as its name seems to indicate, as it has simply appropriated, to the distrust of Victoria, the name of the contiguous great island on which the older city is situated. This city is new — most of it very new, for about twenty-five years ago it made a fresh start, after a fire that almost annihilated it. Since then, and especially within the last dozen years, it has grown enormously. I was the guest of former members of my first congregation, who left the old Fifeshire village for this new land twenty odd years ago, and three years ago came to this farthest West. Their house is in the suburb of North Vancouver, which when they arrived had no existence. It has actually made great progress since I left home! Tram cars now run along populous streets, where eighteen months ago there was nothing but forest. Charred tree-trunks, the relics of forest fires, stand like black spectres among dainty villas; while in stumps here and there you can see from the side-walk the cuts made by the lumber-men for the insertion of their "spring-boards," on which they stood to work their great two-handed saws. Here, indeed, East meets West; or, perhaps more correctly, West meets East. The turban is common on the streets of Vancouver. Every fifth man you meet is an Oriental; well, at all events it looks like that. The proportion of the female to the male population is as fourteen to twenty-five, the disparity being partially explained by the fact that, with the exception of a few Japs, the Orientals do not bring their women-folk with them. Consequently they are credited with little intention of settling down. They are looked upon simply as cheap labourers, whose presence has already lowered the wage standard. Their admittance to the province is barred by law, except under such conditions as are practically prohibitory. When I was there the city was moved by a rumour that a ship-load of Hindus was on its way over in a Japanese tramp steamer. The rumour did not receive anything like universal credence, and as the days passed and nothing was heard of the mysterious craft it began to be smilingly referred to as the phantom ship. But the crowd of our dark-skinned fellow-citizens has since turned up all right, and the fat is in the fire. With the exception of a score or so who have already been in Canada, and are simply returning, none of the consignment has been allowed to land. It is believed that they will all be "declined with thanks," and bundled home again. 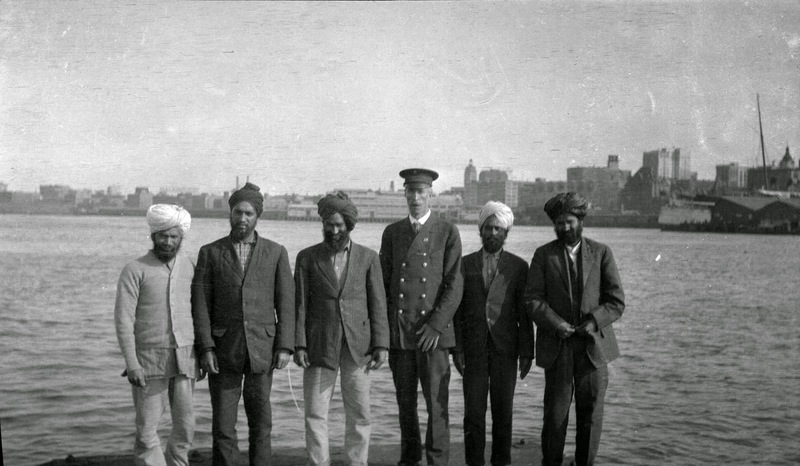 Passengers from the Komagata Maru. Vancouver Archives# CVA 7-127. It is possible that this was the ship to which Rev. Pollock refers. I had the good fortune to synchronise my visit with a banquet of the women's section of the local Canadian Club, and had the honour to receive a hurried invitation as an unexpected guest. The elite of Vancouver feminine society was there, and was addressed at considerable length by Principal MacKay, of Westminster College. The speech was an able one; but it was longer than it was broad. And I could see that the policy of exclusion was popular with this fair audience. The speaker did not definitely advocate any particular policy, and it seemed to me that he was feeling his way with his hearers. I felt, however, that as Boyle Roche might have put it, the cloven hoof of a short-sighted racial prejudice ran through it all. When I was requested, somewhat to my surprise, to address the company. I ventured to say that, while I was by no means as ready to express a dogmatic opinion on Vancouver's burning question as some native Canadians were to dictate to Belfast, I had what was probably a constitutional bias against all artificial and mechanical solutions of racio-political problems. Of course, if "God hath made of one blood all nations of men to dwell on all the face of the earth," we have it on the same high authority that He also "hath fixed the bounds of their habitation;" but that clause might well stick in the throat of the greatest colonising nation of all history. For my own part I shrank from any policy that might dull the fervour of a Christian anticipation of the good time ahead, "when man to man the world o'er shall brothers be." Perhaps the soundest moral argument for the partial exclusion of the Asiatic bases itself not on the unctuous assertion that we are too good to have him among us, but on the more obvious fact that we are not good enough to run the risk. 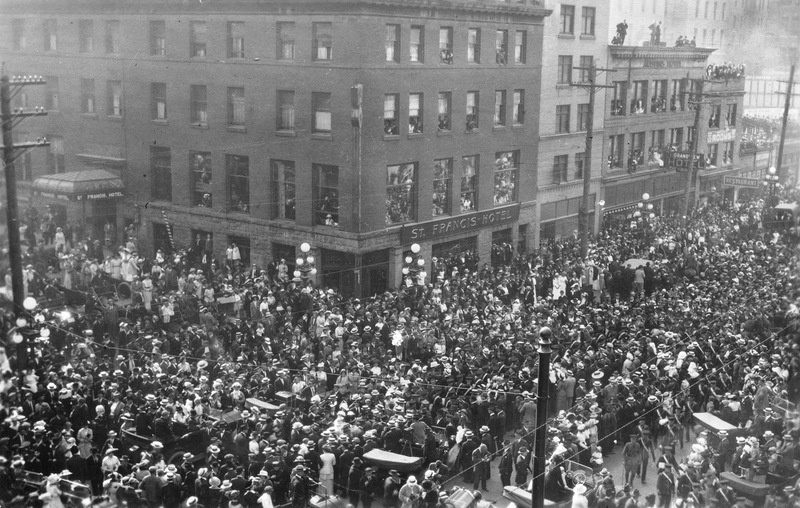 Crowds outside the C.P.R. Station for the embarkation of the first overseas troops. Vancouver Archives# Mil P276.1. Vancouver is the terminal of the Canadian Pacific Railway proper; but if you want to go further west the C.P.R. can accommodate you. The whole sea-front belongs to the C.P.R. It is told of a man who had travelled as I have done, across the continent by the C.P.R., staying in C.P.R. hotels, literally living and moving, week in and week out, in an all-pervading atmosphere of C.P.R., that when he came to this C.P.R. city of Vancouver, and asked a man on the street for the correct time, he was told that it was "2-47, C.P.R" "Man alive," he exclaimed, "don't tell me that the C.P.R. owns the time!" You need not abandon the C.P.R. when you reach the coast, for you can go by C.P.R. liners to Melbourne or Yokohama if you want to. And so I got on board the sumptuously appointed C.P.R. steamer for Victoria. It was a five hours' run, through scenery which, if it does not surpass in beauty the Firth of Clyde itself, runs it close. The lack of human life is its main defect. We passed only two small items of coasting craft. There was not a single town or village visible between Vancouver and Victoria and very few isolated houses. The approach to Victoria, the Capital of British Columbia, is very fine; but the city itself is by no means impressive at first sight. Even when experienced passengers gather at the gangway rail, and the Steamer slows down, and the men stand ready to fling the ropes you see nothing but a wealth of foliage, surmounted by the majestic dome of the provincial capital, with a few attendant towers and spires. Then the helm goes down, the ship swings round a point where no point seemed to be, and you find yourself at a busy wharf. I spent only a few days in Victoria, but during that time the natural beauty of the city grew upon me. With exception of Edinburgh and Hamburg, it is the fairest city for situation I have ever seen. As western cities go, it is old; its first European settlers reaching it, of course, by way of Cape Horn, while as yet the great continental interior lay unexplored. It has an old-world atmosphere about it, and some of it looks as ancient as Quebec. Vancouver has its giant pre-historic pines; but Victoria has its magnificent English beeches, with here and there a gnarled oak of patriarchal air. The population is mainly English, there being but a thin sprinkling of Irish and Scotch. From East to West the tested chain holds fast. The well-forged link rings true!" Reprinted from the The Witness, 10th July 1914, this article was part of a series called 'Cities of the West' by Rev. John Pollock of St. Enoch's Presbyterian Church, Belfast. And dutifully drop their shells a dozen miles away. To enable Messrs. Vickers to converse with Messrs. Krupp. Where they are planted, there they stop. 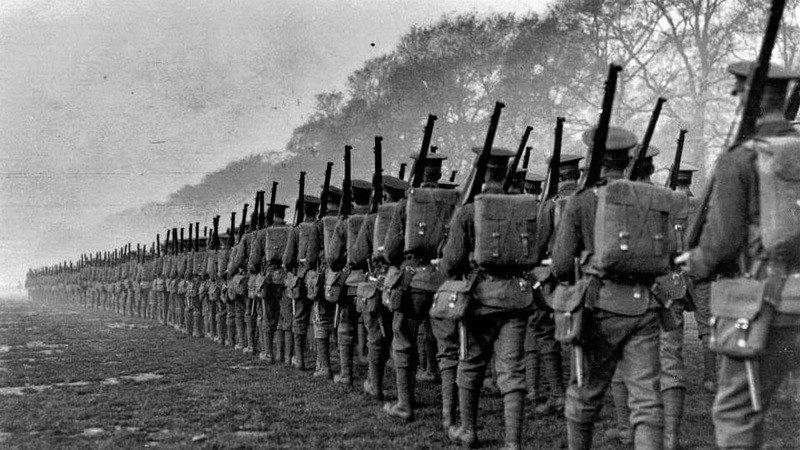 To wait at fifteen hundred yards and clear the trenches out. And shakes the tiles and scatters glass on distant window-sills. The barricades and bastions of any German town. The men and the guns of the R.G.A.! To roll down every Eastern road a-booming to Berlin! Text: Punch, 30th December 1914. Ten years ago there was no Edmonton to speak of, and rather less Calgary. Neither of them has much of a past, and, alas! the present is not exhilarating; but each of them believes it has a big future. Each of them button-holes the visitor, and assures him, in an inconsequential way, that it is shaping to be the greatest city on this Continent, sir. Of course, the forecast is not necessarily discredited by the fact that every tenth shack-town in Canada holds the same modest estimate of its own ultimate destiny. The province of Alberta, stretching west to the watershed of the Rockies, and from the frontier to the great North-West Territory, has an area of over 253,000 square miles, or nearly 5,000 more than double that of the United Kingdom. A large proportion of British soil is mountainous and otherwise barren; Alberta is fertile, besides being rich in coal, oil, and natural gas. But, while the population of the British Isles shows 470 to the square mile, Alberta has less than two. Thirty years ago she had 20,000 inhabitants, at the beginning of the century a little over 70,000, to-day 500,000. During the decade 1901-11 Alberta's population advanced 413 per cent., probably the largest provincial expansion on the planet. In a recent year 20,000 acres were taken up by settlers every day! Yet only three per cent, of farm land has been appropriated, leaving nearly 100,000 acres still available. The Albertan is naturally proud of his province. One could hardly be astonished if in Alberta measles were less common than megalocephalus; which, I am told, is the correct word to use when you don't want to say swelled-head. Now, Edmonton is the capital of Alberta. It magnifies its office, and is doing its best to live up to its Metropolitan dignity. The Parliament House is a fine building; for beauty of architecture it is Canada's nearest approach to Belfast City Hall. The population of Edmonton is increasing so rapidly that were I to set down the correct figure, which nobody knows, the comp. would do well to add a thousand or two. Edmonton's own estimate is no more trustworthy than Calgary's estimate of Edmonton. Probably it is somewhere in the vicinity of 55,000. Already the city has about forty miles of paving, one hundred miles of water-mains, and twenty miles of boulevards. Its eye is ever on the future, and all its plans are cast in the interests of the million-peopled city of next generation. Its street numbers run up to figures that make you catch your breath. At present an effort is being made, so far with but moderate success, to introduce the modern American numerical system of street nomenclature. Street and avenues lie at right angles to each other, and are numbered in regular sequence. The system has undoubted advantages, the most important being simplicity. Between each street or avenue and the next there are one hundred numbers; or rather, after each street or avenue a new hundred begins. If you want 253 on 17th Avenue, you look for it after 25th Street, about half-way to 26th. Till quite recently the streets were named, and the numbers stood in no relation to the "blocks." The transition means temporary chaos. Here, for example, is 568; and you want 371. Yon walk back a block or two and find yourself among the ten thousands. Nobody can tell you whether 34th is the old Problem Street, or whether Puzzle Boulevard is now 49th Avenue. On one such perplexing hunt I stood and pinched myself. Was I in the throes of that ghastly nightmare, usually induced by a cheese supper, in which I make vain attempts to reach a constantly receding destination, arriving in time to see an angry congregation dispersing? I almost expected to find myself, in a cold sweat, staring at my bedroom wallpaper. Really, the making of a city is no joke, especially when the raw material comes tumbling in upon you in such profusion; and some of the material is very raw. While in Edmonton I sojourned with an old St. Enoch's family, whose house cannot now be described as being on the outskirts; not three years ago, when they arrived, they could shoot game from their front windows. There was not even a board side-walk. Street lights there were none. Now, that house is within a stonecast of a well-patronised tramline, with frequent service, on a thoroughfare as busy as Antrim Road. Alongside of handsome stone buildings, with pillared facades, those still stand most primitive erections not yet old, run up when what is now a busy commercial area was nothing but a trackless bush. One of the leading physicians, whose parents I had met on a visit to Belfast some years ago, ran me all over and around in his auto, and gave me such a comprehensive view of Edmonton as I could not otherwise have had. We visited the old British fort, built of rough logs, which was the nucleus of the present city. He showed me the famous Death Trail, along the course of which so many dropped and died in that tragic rush to the Klondike. My friend drove me through the principal streets, avenues, and boulevards of the "twin cities" of Edmonton and Strathcona, which are now one. The impression made upon me was that this will one day be a most beautiful Metropolis. In the making of it space has not been spared; indeed, many of the streets are much too wide. On the Strathcona side there is in course of erection for the University of Alberta what will be one of the finest educational suites of buildings in the Dominion. Affiliated to the University is a Presbyterian college, with over forty students in residence, whom I had the pleasure of addressing. From Edmonton I went South to Calgary. Seven years ago, on my way to the Christian Endeavour Convention at Seattle, I stepped out of the train, and, while most of my fellow-travellers were lunching, spent ten minutes in what was then a very small town. Turning the corner of the little wooden waiting-room, I found myself in a street of frame houses, with one or two unimpressive buildings of brick. There were, if my recollection is correct, nothing but plank side-walks. Of course, there were no tramways, for there was no place for street cars to go to. Ten minutes was quite sufficient for viewing the little town. I expected to see a great change on my second visit; but what I expected wasn't in it with what I saw. Leaving the large and well-appointed station, I stood in amazement in a handsome thoroughfare, adorned with massive electric candelabra of the very newest pattern. Beautiful Corporation tramcars whirred past at brief intervals, crowded with passengers. One of them was the most artistic thing in tramcars I ever saw, built a la charabanc, enamelled in bright colours, and sparkling with silver mounted fittings. It was the "observation car," in which I afterwards made a delightful tour of the city for twenty-five cents. Around me towered some of Canada's most aspiring skyscrapers. Led by a friend, I ascended one of them – by elevator, of course: the beautiful "department store" of the Hudson's Bay Company, perhaps the richest corporation in the Dominion, whose shares cannot now be bought at any price. From the roof I saw one of the sights of my life, the snow-capped Rocky Mountains on the far horizon. It did not look far; twenty miles or so. The atmosphere was so clear that the distance was deceptive, for the nearest peak is almost one hundred miles off. The Rockies were not again visible during my visit. TO BE A "CITY BEAUTIFUL"
According to "police estimate," Calgary has a population of 63,000. It baa seventy miles of tramlines. Measured by its bank-clearings, it is already the sixth in importance among the cities of the Dominion. For beauty of situation it is surpassed by few, if any. Just when I was there a scheme for the beautifying of the city was being submitted to the Corporation, and has now probably been adopted. It means the gradual expenditure of an enormous amount of money; but if carried out in its entirety, as doubtless it will ultimately be, it will make Calgary a rival of Washington, if not of Paris. The scheme is the work of an eminent architect, and includes a spacious and beautiful "civic centre," broad tree-lined boulevards, the utilising of severe gradients by the erection of terraces and parterres, with marble facings and stairways, embellished with statuary, leading down to the finest of public parks. Would that I might be there to see! But it was pointed out by the architect in his "exposition" that the Napoleonic scheme for the beautifying of Paris is only now nearing completion. 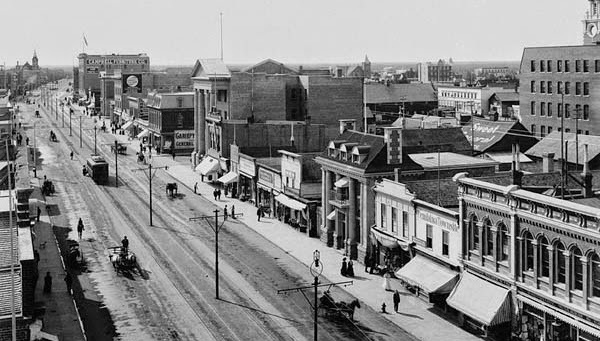 As it is, Calgary has already done well, and made considerable progress towards the goal of its ambition, a foremost place among the beautiful cities of the world, and first place on the American Continent. And, as the proverb hath it, "Aim at a silk gown, and you're sure of the sleeve." WHAT IT IS TO "STRIKE ILE"
Calgary is a more famous town to-day than it was when I was there a fortnight ago. Then it was "as flat as flat." No poor hunter for dollars ever felt more out of it than I did. You couldn't get salt on their tails. 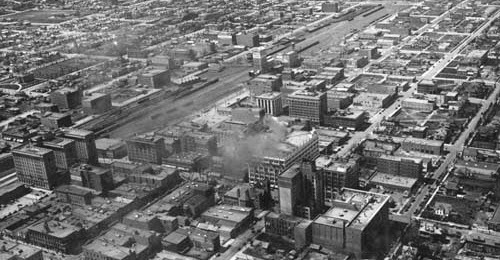 Since then the city has become the centre of a terrific oil boom. The boring has been going on for years, and hope deferred had made many hearts sick; but one day the piercer struck tile subterranean reservoir, and the precious fluid spurted the height of the Albert Memorial. It has now settled down to steady work, and is yielding over two hundred barrels a day. The touts were at me when I was there, beseeching me, in their oiliest manner, to have financial mercy on myself; but, with that consummate prudence for which I have always been distinguished, I declined to speculate. Wish I had known! One man had bought a thousand shares in that particular bore, at half a dollar. When the oil spurted he sold fifty for his money; so that now he has nine hundred and fifty which have cost him nothing. My! I might have come home a dollar millionaire, and cleared the debt not only of St. Enoch's, but of the Church House an well. I never felt so generous in my life. Reprinted from the The Witness, 12th June 1914, this article was part of a series called 'Cities of the West' by the Rev. John Pollock of St. Enoch's Presbyterian Church, Belfast. 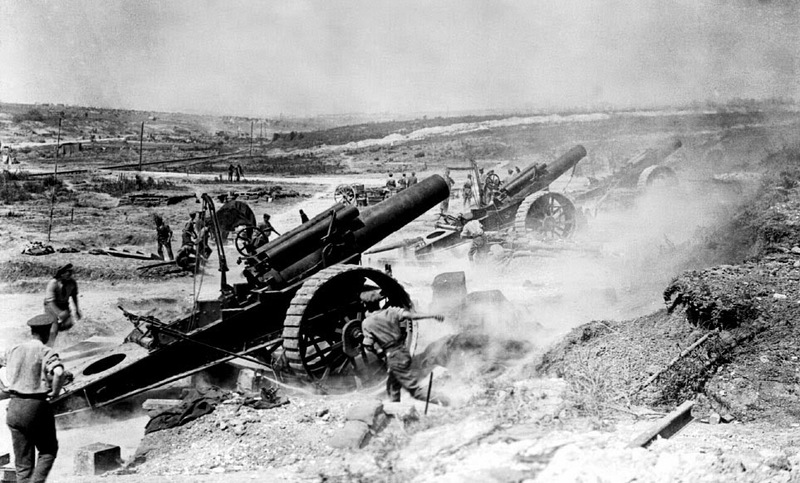 And fought beside the gallant French. Beneath the turf of La Bassée. And still we charge, a thousand strong! This poem is reproduced from Punch, 3rd February 1915. In bracketing Ottawa with Edinburgh I pay compliment to both cities. Both are beautiful, and each is fairer than the other – with a difference. If Ottawa has no Arthur's Seat, Edinburgh is without a river. Possibly the Western Metropolis may be even more east-windy, but she is less west-endy than the Eastern. Nevertheless, there is a certain Metropolitan tone about her, an atmosphere which indicates a corporate self-esteem. One cannot be half-an-hour in the city without being reminded of Edinburgh. Why, here is a Princes Street charabanc, guard's tin horn and all, just as if it were about to start for Rosslyn! Round the corner is heard the skirl of the pipes; and as the stalwart kilties swing into view you almost feel as if you were in the Lawnmarket. If their uniform is open to criticism – including as it does Rob Roy hose, Forty-second kilts, Royal Stewart plaids, and glengarries that sport the Borderers' check – the incongruous combination is not ineffective. As you walk along Sparks Street you hear about as much of the Scotch accent as you do at Portrush at Glasgow Fair time. On this last day of October there is an Edinburgh nip in the air. In Montreal, as I left it, the talk was of all Saints' Day, when many of the business houses close; but here the shop windows proclaim the popularity of Hallowe'en. I have made no statistical inquiry as yet; but I have a strong impression that there are more Scottish Born in Ottawa than there are in Belfast. And I am told that if I keep my eyes open – which, of course, I sternly refuse to do – I shall see more good-looking girls here than in any other city in the Empire outside of the Scottish capital. Edinburgh papers please copy. Ottawa is a beautiful city: beautiful for situation, and beautiful in itself. Here again, indeed, it resembles Edinburgh, in that its beauty is largely self-contained. Beyond the suburbs there is little worth going out of the city to see. But the city itself is beautiful both from without and from within. Looking from Riddeau Street, over the fine new ornamental bridge which spans the railway, up towards Sparks Street on the higher level, it puts no great strain on one's imagination to fancy himself looking over the South Bridge, with his back to the Register House – the Post Office representing the "Scotsman" building, and the magnificent Chateau Laurier, though on the wrong side of the street, the North British Hotel while just over the parapet is the Waverley Station in miniature. Within a stonecast are some of the handsomest buildings, though by no means the largest, on the North American Continent. Of course, as Glasgow never misses an opportunity of reminding her proud sister, the chief buildings of the Metropolis belong equally to all the cities of the land, for they are national. 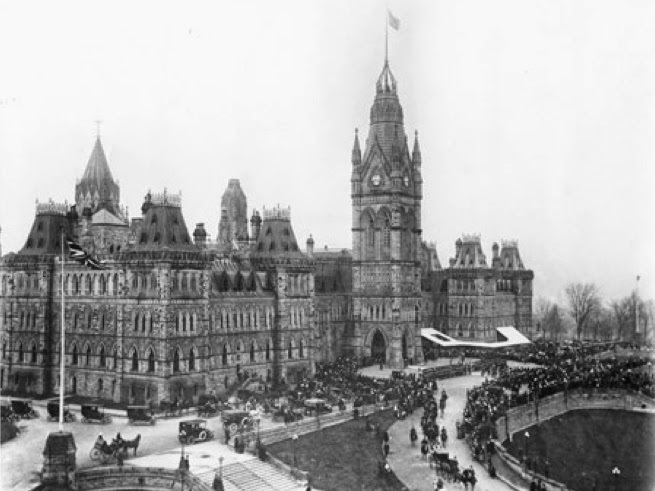 The seat of the Dominion Parliament is a magnificent pile, an extensive suite of imposing architecture, placed perhaps more picturesquely than any other legislative buildings in the world, crowning a wooded height that looks down upon the river. The approach from the city is very fine, an ideal setting for a State cavalcade. Unfortunately for me, the Houses were not in session. The chambers where the affairs of the young nation are discussed were deserted, and the furniture was in overalls. But I gave myself the thrill of sitting in the seats of the mighty, including the Speaker's chair. Armed with a note of introduction I penetrated into the Parliamentary Library, a stately-domed poligon, said to be the largest apartment without pillars on this side of the Atlantic, and strongly resembling the historic reading room of the British Museum. Here I had a most fascinatingly interesting conversation with Dr. Griffin, the Chief Librarian, who gave me no end of entertaining "inside" information about Canada and its Parliament. Mercenary motives led me into the presence of more than one of the Ministers of State, and I found them delightfully human. One of than, after handing me a cheque, thrust his arm in mine, and led me out to his club, where we had a toothsome "meridian" together, and talked on a variety of topics, including Home Rule. He also introduced me, as a brother Scot, to some men of wide fame; and I came away feeling that after this the privilege of shaking hands with me was one not to be granted without discrimination. Looked at from the clubhouse window on Parliamentary Boulevard, the main building, with its commanding position, its extended facade, its lofty tower, its spacious gravelled terrace, reminded me of my Alma Mater, Gilmorehill University. I must climb that tower, and have a look at the fair city from its elevation of something like two hundred feet. And it was a climb, that might have ended in disaster; for as I clung to the narrow and almost perpendicular ladder, with my ear a few inches from the biggest bell in Canada, "the clock struck one, and" – well, the famous mouse and I understand each other. But the view is worth it all. In the foreground lie the winding walks of Parliament Hill, embraced by an arm of the Ottawa river, with beautiful bridges upon it like bangles that glitter in the sun. Over the river, on Quebec territory, is the City of Hull, and on the distant horizon the famous Laurentian Hills. On the right, like the hanging gardens of Babylon, are the first eight of the forty-seven locks of the Riddeau Canal, by which it accomplishes the ascent of nearly five hundred feet to Lake Ontario. Beyond peeps Riddeau Hall, the official residence of the Governor-General, which in summer must be wholly invisible in its umbrageous environment. Walking, map in hand, around the tower gallery, several outstanding buildings attract attention – the National Gallery, the Dominion Observatory, Ottawa University, and a number of handsome churches, conspicuous among their spires being that of St. Andrew's, where the Presbyterian "quality" most do congregate. Ottawa is rich in public parks. There are Bingham's Park, Riddeau Park, Rockcliffe, Sandy Hill, and, most beautiful of all, the Government Driveway, which almost encircles the city, and a walk in which carries one in imagination to West Princes Street Gardens. It is, indeed, a fair prospect from the tower. What must it be "in the summer time, when the leaves are on the trees!" When the late Professor Blackie was asked what was Edinburgh's principal industry, he replied, "Education." I am not sure that this is as true of Ottawa; but certainly the Canadian capital is not, in the ordinary sense, an industrial centre. The whole life, of the little city moves around the Parliament House. This rather unhealthy condition of affairs was historically inevitable, "Bytown" having been chosen as the seat of government not on account of its importance – for it had none – but simply because of its political and strategical advantages, and the magnificence of its site. Bytown did not make the selection; the selection made Ottawa. The village of 1827, with a population under one thousand, has become, with her twin sister across the river, a city of 150,000 inhabitants. The presence of the Legislature will cause her to be more and more, like Edinburgh, the home of eminent lawyers and litterateurs, and create an aristocracy of intellect around the Viceregal Court. Already there are, in proportion, more titled people in Ottawa than elsewhere in Canada, men and women who have, most of them, won the honours they wear. The business community is rapidly enlarging itself; so that soon Ottawa will not have all her eggs in one basket. She is evidently resolved to take her place among the busy centres that throb with commercial and industry life. It is a safe prediction that, say, twenty or thirty years hence, Ottawa will, by reason of his intrinsic excellence, be one of the foremost cities of the Dominion. Reprinted from the The Witness, 23rd January 1914, this article was part of a series called 'Cities of the West' by Rev. John Pollock of St. Enoch's Presbyterian Church, Belfast. For those who fight and those who bleed. May rest in glorious liberty. Thy servants, who must stand and wait. A portion of the awful care. On those whom Thou hast bidden "wait,"
And one by one hope's mornings die. The workings of Thy hidden will. Reprinted from The Witness, 29th January 1915. 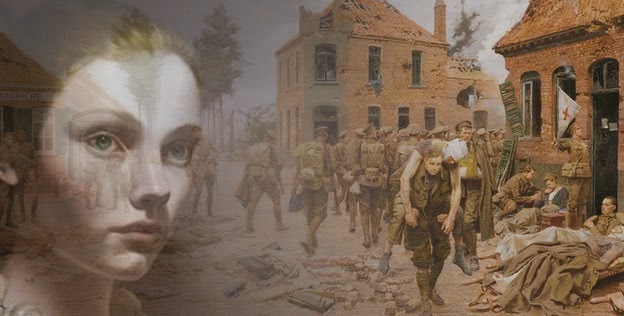 Image: Mashup of a painting of a post-battle scene at Menin crossroads by Fortunino Matania and a portrait of an unknown woman. 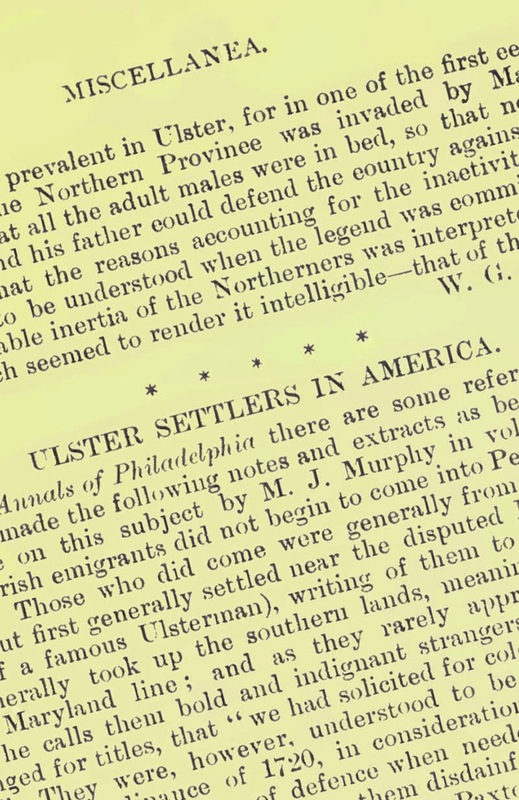 In Watson's Annals of Philadelphia there are some references to early Irish settlers. I have made the following notes and extracts as bearing slightly on the important article on this subject by M. J. Murphy in vol. ii., page 17, of the Journal. The Irish emigrants did not begin to come into Pennsylvania until about the year 1719. Those who did come were generally from the North of Ireland. Such as came out first generally settled near the disputed Maryland line. James Logan (himself a famous Ulsterman), writing of them to the proprietors in 1724, says they generally took up the southern lands, meaning in Lancaster county, towards the Maryland line; and as they rarely approached him to propose to purchase, he calls them bold and indignant strangers, saying as their excuse, when challenged for titles, that "we had solicited for colonists and they had come accordingly." They were, however, understood to be a tolerated class, exempt from rents by an ordinance of 1720, in consideration of their being a frontier people forming a kind of cordon of defence when needed. They were soon called bad neighbours to the Indians, treating them disdainfully, and were the same race who finally committed the outrage called the Paxton massacre. James Logan, a great mass of whose correspondence is still preserved, writes in 1729, saying that "he is glad to find the Parliament is about to take measures to prevent the too free emigration to America. In the meantime the Assembly had laid a restraining tax of twenty shillings a-head on every servant arriving; but even this was evaded in the case of the arrival of a ship from Dublin with 100 Papists and convicts, by landing them at Burlington. "It looks," writes Logan, "as if Ireland is to send all its inhabitants hither, for last week not less than six ships arrived, and every day two or three arrive also. The common fear is that, if they continue to come, they will make themselves proprietors of the province. The Indians themselves are alarmed at the swarms of strangers, and we are afraid of a breach between them, for the Irish are very rough to them." In 1730 he writes and complains of the Irish possessing themselves in an audacious and disorderly manner of the whole of Conestogoe manor of 15,000 acres, being the best land in the country. In doing this by force, they alleged that "it was against the laws of God and nature that so much land should be idle while so many Christians wanted it to labour on and to raise their bread." The Paxton boys were all great sticklers for religion and for Scripture quotations against "the heathen." They were, however, dispossessed by the sheriff, who burned their cabins, to the number of thirty, and restored their lands to the Indians. This violence was remembered with indignation, for, 25 years after, the Paxton massacre began by the killing of the unoffending Christian Indians living in Conestogoe. The Irish generally settled in Donegal. In another letter Logan writes, saying "I must own, from my own experience in the land office, that the settlement of five families from Ireland gives me more trouble than fifty of any other people." His successor, Richard Peters, had also trouble with the Irish, for on going in 1743 with a sheriff and magistrate to dispossess the Squatters at Marsh Creek, in Lancaster county, and to measure the manor land, they raised a riot and drove him away. The inhabitants of Paxton were Irish Presbyterians. Their minister for sixty years was the Rev. John Elder. He came to them from Ireland in 1732, lived to be eighty, and died in 1792. Watson knew his son, Thomas Elder, "a gentleman of the Bar at Harrisburg." The Rev. John Elder held a colonel's commission in 1755. He writes from Paxton to the secretary, R. Peters. "There are within this few weeks upwards of forty of his Majesty's subjects massacred on the frontiers of this and Cumberland counties, besides a great many carried into captivity: and yet nothing but unseasonable debates between the two parties of our Legislature, instead of uniting on some scheme for the protection of the province. What may be the end of these things God only knows: but I really fear that, unless rigorous methods are speedily used, we in these back settlements will fall a sacrifice, and this part of the province be lost." About 1720, Elizabeth M'Gawley, an Irish lady, brought over a number of tenantry, and settled with them near Philadelphia. She had a chapel attached to her house. Near the place (about one-eighth of a mile off) is a stone enclosure, in which is a large tombstone of marble, inscribed with a cross, and the name, "John Michael Brown, ob. 15 Dec, A.D. 1750. – R.I.P." He was a priest. In 1741 the Philadelphia papers announced to merchants and shippers that Augustus Gun, of Cork, has power from the Mayor there to procure servants for America. Such an advertisement was, of course, an intimation that the Mayor of Cork was willing to send off sundry culprits to the colonies. 1729. In New Castle government there arrived last year, says the Gazette, forty-five hundred persons, chiefly from Ireland, and at Philadelphia eleven hundred and fifty-five Irish. New Castle is on the Delaware below Philadelphia; it is one of the ports to which emigrant ships sailed from Belfast in the last century. Watson has an interesting note about potatoes. He says – "This excellent vegetable was very slow of acceptance among us. It was introduced from Ireland in 1719 by a colony of Presbyterian Irish, settled in Londonderry in New Hampshire. They were so slow in its use in New England, that, as late as 1740, it was still a practice with masters to stipulate with some apprentices that they should not be obliged to use them." Ulster Journal of Archaeology, Vol. 2, No. 2, Series 2, Jan 1896. In February, 1795, my great-grandfather, Captain Alexander Chesney, of Packolet, County Down, who fought for King George in the war of Independence, noted down the names of a few Ulster settlers which may now be worth recording. They were all settled in South Carolina before the war, and, unlike him, appear to have taken the American side. They were Presbyterians, as he was. Matthew Gilespey married Martha Chesney, and settled near Enora River, 1768, and left children. John Cook, married to Sarah Fulton, settled on the Packolet River, and left children. ---------- Nesbit, married to another Fulton, settled in Waxhaws, South Carolina, and left children. Thomas and John Purdy, of Glenravel, settled in Pennsylvania. Their sister, Jane Purdy, married to Robert Chesney or M'Chesney, of Dunclog, County Antrim, emigrated with her husband and eight children to America, sailing in "the scow James and Mary from Larne," and making the passage in seven weeks and three days. From Charlestown they travelled in wagons, paying a penny a pound for the use of them. They travelled thus to Jackson's Creek, "stopping at John Winn's old place, now Winnsborough," and leaving the family with some Ulster settlers, "John Phillips, now Colonel Phillips," till a home could be prepared. A hundred acres of land were surveyed for the Chesneys, a cabin bought, and some land cleared, when a message came from John Cook, of Packolet River, 60 miles off, inviting the family to settle there. "I proceeded there on foot," says Chesney, "there being no direct road. I was to inquire for John Quinn, blacksmith, on Sandy River, about 20 miles off; the first house I came to. Then to Ned Hill's, where I crossed the river in a canoe, thence to my aunt's on the Packolet River. The settlers near, being all relations, gave me weight, and they soon found me a tract of 400 acres, which I had surveyed. I soon returned for the whole family, and we settled there." This sketch of how a family, in almost tribal numbers, moved from Ulster to America, may be of interest to your readers. The rest of the MS. gives a vivid picture of the war, and the isolation of the writer from his kindred owing to his loyalty.